"in a strange way they're more permanent then the buildings themselves. cafe aventura is gone, dread lady is still here." though, it should be noted that the buildings are still there. cafe-A is gone, yes, but the garage still stands, and "crazy crusts" or some silly pizza chain with a similar name has taken its place. even so, the homeless pop does seem, ironically, to have the semblance of greater permanence. hasnt left me; on the contrary, it's turned into a permanent fixture engraved in the wall of my memory. but i'm writing b/c its true -- i was visiting H sq recently and thought something quite similar, recognizing faces from a decade prior. still on the outside. 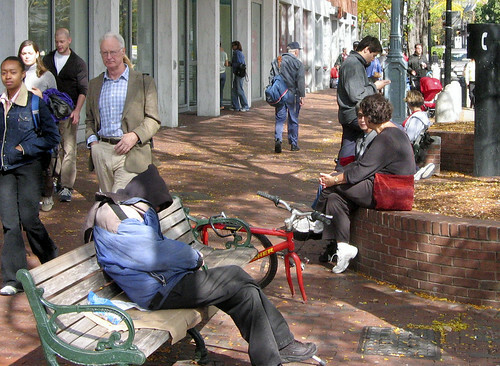 I spent one summer on the hallowed streets of Cambridge, and I got to know the homeless people that called the Square home, better than I got to know some of the people I was taking classes with.